Mr Ahmad studied medicine at Oxford and Cambridge, also spending some time as a teacher in anatomy at Cambridge University before undertaking General Surgery training for the FRCS qualification. Whilst specialising in Plastic Surgery, he also spent some time in research at the renowned Medical Research Council in Cambridge. 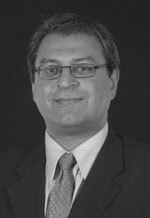 Mr Ahmad trained in the sub-specialty of Cleft Lip and Palate Surgery in Cambridge, Edinburgh and Great Ormand Street Hospitals as well as visiting several units abroad. Application of computers to the practice of surgery, including 3D imaging, cleft lip and palate and melanoma. Mr Tariq Ahmad does not hold a share or financial interest in this hospital, another Nuffield Health hospital or the company. Mr Tariq Ahmad does not have a share or financial interest in equipment used at this hospital or another Nuffield Health hospital. Mr Tariq Ahmad does not hold any paid advisory role(s) at this hospital or on behalf of Nuffield Health.